Here's a whimsical baked treat, with a trompe l'oeil twist that has nothing to do with vintage recipes but everything to do with fun. This is a great project to do with children, now that summer vacation is almost upon us. 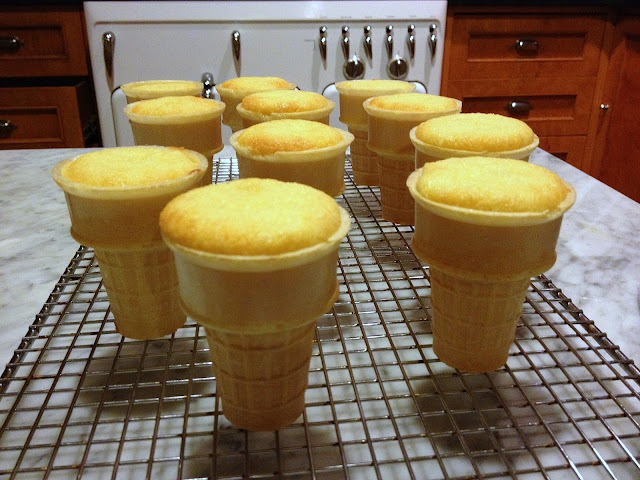 These are as simple as making cupcakes: Just make your favorite chocolate or vanilla cake recipe (yes, you can even use a boxed mix) and fill wafer cones with the batter, about 2/3 to 3/4 full. Bake as usual -- the cones will not burn, I promise. In fact, they won't even change color. The big challenge with these -- as with most of life -- is balance. 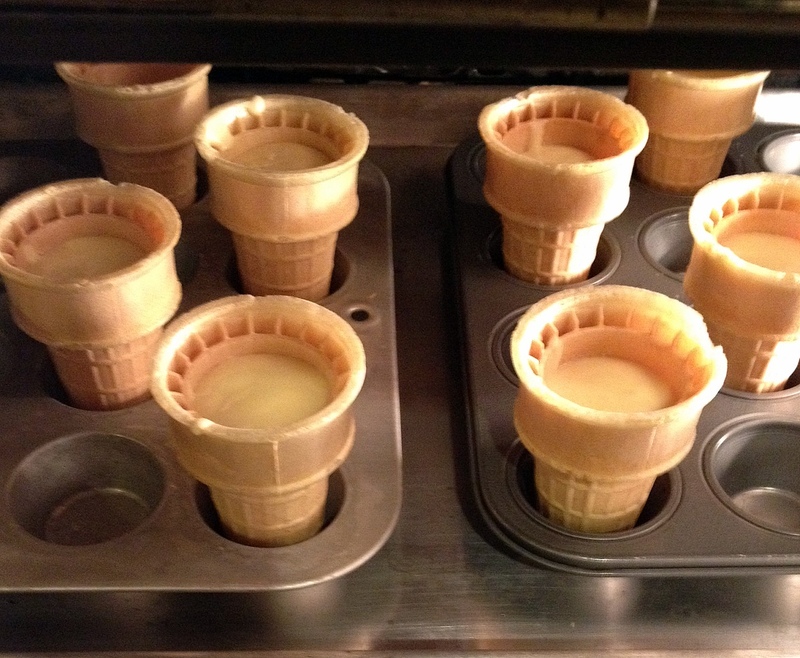 I placed the cones in miniature muffin pans, which worked beautifully. If you haven't any of those, try regular cupcake pans, or use foil to create some kind of support -- these will want to topple over. When I say use any cake recipe, I mean it. I followed a one-egg cake recipe from my collection and made every mistake in the book during the preparation but even that mess of a batter worked beautifully. My daughter, who introduced me to ice cream cone cupcakes, uses angel food cake mix. 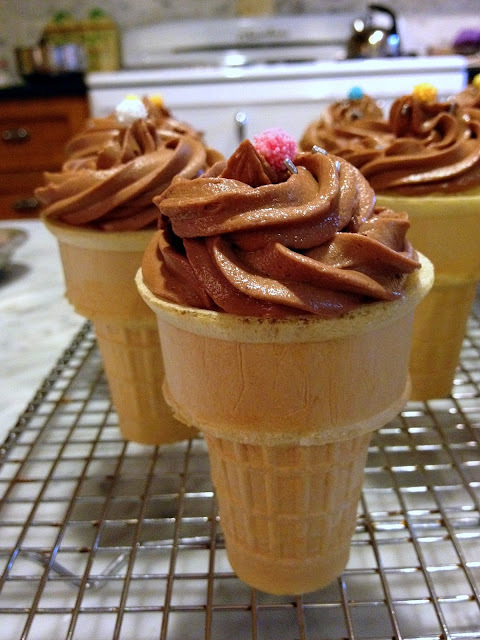 Ice cream cone cupcakes are not about flavor, but novelty and appearance. Use your favorite buttercream recipe to top these. Do not use canned frosting. Ever. It is vile and should be banned. For my confection, I created a frosting using a recipe from the Magnolia Bakery and adding some melted, unsweetened chocolate. To create the soft serve appearance, you'll need to put the frosting in a pastry bag fitted with a star tip. It's very easy, really. But you can also just pile the frosting on, for a traditional ice cream look. Of course, sprinkles add a nice touch. These are best served at home, while sober. Below is the last intact photo of my ice cream cone cupcakes. I managed to carefully transport them across the street to our neighborhood pot-luck garden party. Once there, a neighbor described by others as "three sheets to the wind" helpfully picked them up to distribute them to other guests. 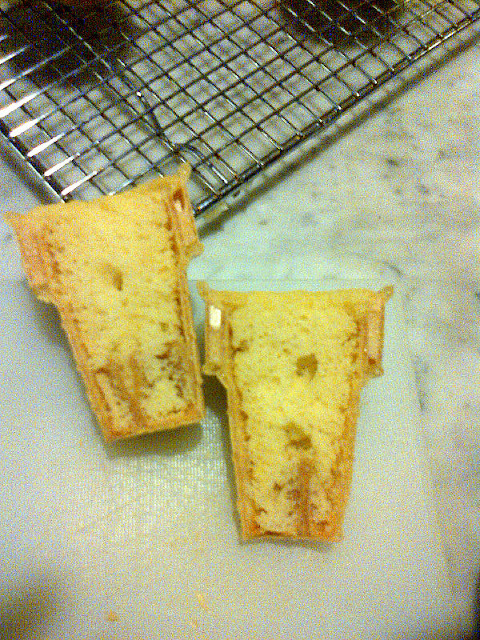 What followed wasn't pretty -- it was a pastry avalanche, resulting in quite a mess for the hostess to clean. And no cupcakes for us to eat. Want to see what's inside of these? I dissected one just because I knew you'd ask. Thanks, Marsha! They are adorable, despite their instability. I agree on the store bought frosting! Especially when it´s so easy to make. These cupcakes are the cutest. I like the look of soft ice cream the piping achieves. Thanks much, Paula. I don't find frosting so easy to make (even though it is), but certainly worth the effort compared to the alternative. And the piping part is a lot of fun. I always think that kids would certainly love these cakeletes!! They're fun and has a surprise in it! Yes, they are perfect for children! I personally didn't care for them, the cake and wafer cone combination didn't rock my boat. But what do kids know?!? Thanks for writing. 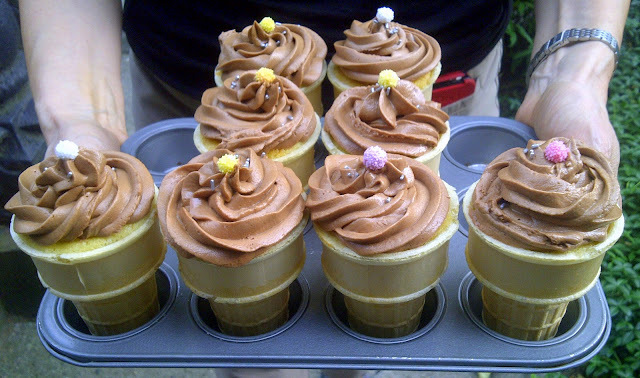 Love the idea of these cone cupcakes! A really fun alternative for kid's party! Nostalgia city! My mom used to bake these for our birthday parties. Thanks for reviving them! I never realized these were so hard to transport. The room mothers at my elementary school must have had a special knack because these were all the rage then! Not sure when these first came on the scene, but they enjoyed a mini-revival for a while in my little town.